Eggplant and zucchini season have about passed, and we are also coming to the end of the apple season… however, I still have a bushel of apples sitting on my counter! I’ve already made some apple butter (I’ll post about that soon) and a little bit of applesauce and now I’m working on dried apples. I love having fresh apples around for the kids to snack on and for making yummy treats for unexpected visits from friends or just a special dessert for our family. We’ve had apple crisp quite a bit and I’ve also used the apples in our oatmeal bake some mornings! 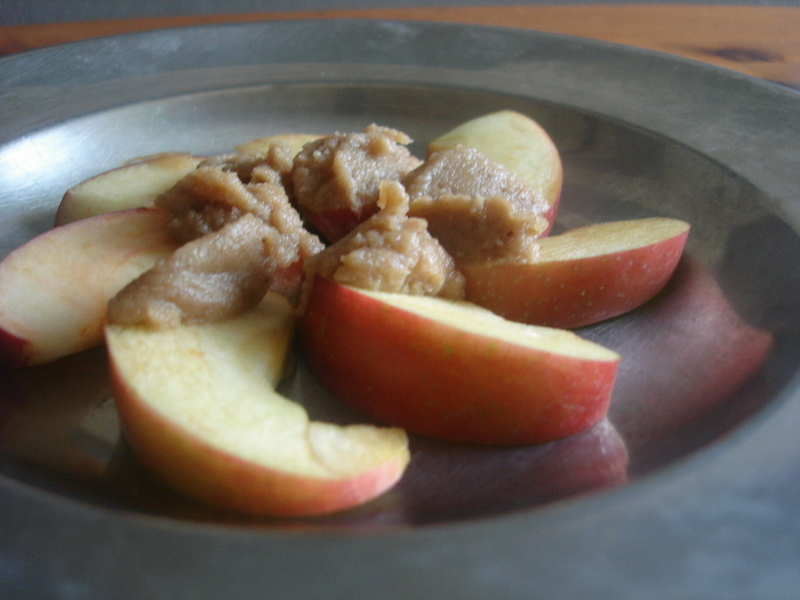 There are so many wonderful uses for apples! They add so much flavor and sweetness! This week I had to bring a snack to my Community Bible Study group and I was trying hard to think of what to bring. I didn’t want to bake anything or have anything too labor intensive since I was working the night before until 11pm and then would have to be up early and have all four kids out the door by 9am. Just too much to try and fit in. One of my favorite fall snacks in the past was fresh apples dipped in caramel sauce. So sweet and creamy and it matched so well with the apples. I thought that would be a simple thing I could make so I started looking around for a recipe that might work. In the past I’ve done almond butter and honey and heated it to boiling to help thicken the honey and it always turned out fantastic, but I didn’t have the time to do it nor did I have enough almond butter…. Hmmm… what to do?! Then I had an ‘Ah-Ha’ moment! And deliciousness ensued! Super simple and amazing in flavor and taste! I added all the ingredients to the [amazon_link id=”B00004S9EM” target=”_blank” container=”” container_class=”” ]food processor[/amazon_link] and pureed until smooth. Just continue adding a little almond milk until you get the consistency you want. I wanted my to be just a little thinner than peanut butter. Turned out great and took all of 5 minutes to mix up! WHEN you give it a try, let me know what you think! Do you have any favorite dips for apples? Thanks for posting! So excited to have this as one of my “keeper recipes”! Hope you like it! Can’t wait to see what you think!